After the Rolex Explorer and Jaeger-LeCoultre Reverso, Mad Men’s Don Draper has now been spotted with an Omega. 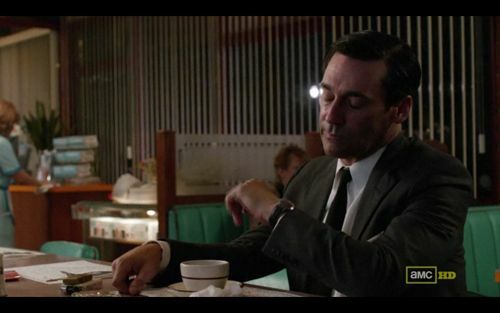 In episode 6 of the 5th season of Mad Men TV-series, Don Draper impatiently checks his Omega Seamaster DeVille watch sitting in a diner waiting for his lady. Despite being introduced as a watch with a water resistant case, the 1950s Seamaster watches were very elegant and not that far away from the more luxurious Constellation collection. In the 1960s, Omega started to develop the Seamaster as a diver’s watch, as we know it today, and introduced the Seamaster DeVille as their more dressy collection of watches. 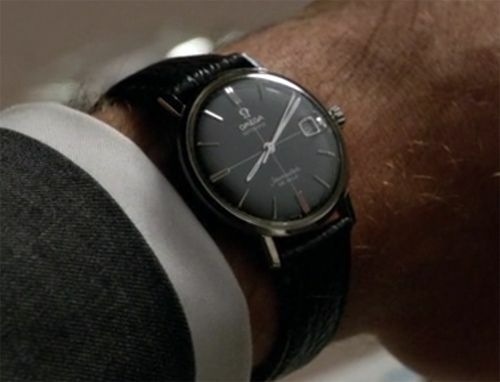 Don Draper wears a Seamaster DeVille with a black dial and a date indicator, like pictured above. This 34mm watch probably has an automatic caliber 562 or 563 and is considered to be one of the nicer automatic calibers that Omega produced in those years. The Seamaster DeVille on the wrist of Mr Draper is early-mid 1960s. Later on, Omega re-introduced the DeVille as a separate collection of the brand. FratelloWatches found a similar Omega Seamaster DeVille (click the link) on eBay, also black dial, in the tres chic gold/steel combination (so called ‘gold capped’) with a caliber 562 movement for a buy it now price of $1295 USD. You will probably be able to find cheaper versions as well, as well as the more expensive all gold versions. Be aware of re-dials and use of incorrect crowns. Being a fan of the show (unfortunately season 5 has not started here yet in The Netherlands) and having seen seasons 1 – 4, I’d say Don Draper has a fine taste for watches. Update: We got some nicer ‘stills’ from our friends at one of the coolest Omega forums around (click here). We also learned that WatchesToBuy is the supplier of these vintage watches to series like Mad Men.